Come From Away, located at the Schoenfeld Theatre, is this season’s feel good musical. This new one-act musical by Irene Sankoff and David Hein is directed by Christopher Ashley and tells the true story of the 38 plans (and their passengers) that were re-routed to Newfoundland, Canada on 9/11. The entire show is performed by 12 cast members who play a multitude of parts including local Newfoundlanders, international passengers, concerned Americans, and flight crew members. The show runs under two hours (no intermission) and spans the several days the passengers spent in Canada while the American airspace was closed. Technically, there is nothing wrong with Come From Away. The ensemble of the piece work amazingly together and handle playing many, many roles quite well. Although the various accents and dialogues they do can be a bit heavy-handed, they are at least accurate. 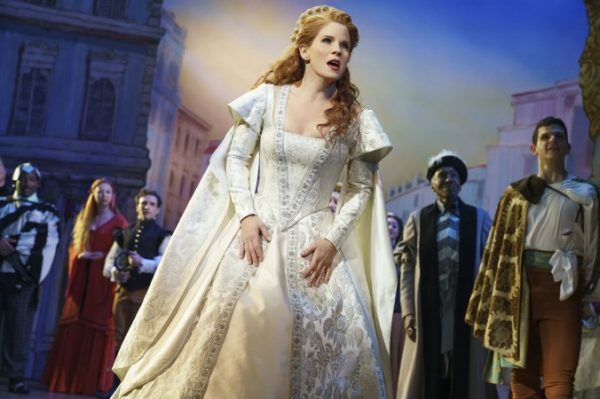 Among the cast, there are no true standouts, but Astrid Van Wheatley, Chad Kimball, Caesar Samayoa, and Jenn Colella (who is nominated for the best-featured actress Tony award) shined a bit more than the rest. The whole musical has a very upbeat and positive vibe of hospitality and community. Overall the show is certainly uplifting, entertaining, and enjoyable; it’s easy listening. However, it certainly is not ground-breaking, precedent-smashing, or boldly innovative. It sort of just exists. There is a quirky group of Canadians, tragedy strikes America, they band together and cook a lot of food and are awkwardly friendly to the “plane people” (as they call them), and then the “plane people” leave, and the show is over. Oddly, the show focuses more on how the time in Canada affected the “plane people’s” lives than 9/11 did. For example, one woman’s son is a firefighter who died trying to save people in the wreckage, but more stage time is spent on a gay couple who break up in Canada and an older British man and Texan woman who fall in love. For some unexplainable reason, the musical is more about Canada than about 9/11. There isn’t much of a plot, and because of the lack of consistent characters, there is much development, conflict, characterization, or climax. So although there is nothing wrong with Come From Away per se, there is not anything that is extremely right with it, either. The musical is very easy to watch, and when you leave, you’ll probably feel good about humanity–something that can’t be said for the more depressing shows this season like Dear Evan Hansen, Miss Saigon, and Sunset Boulevard–but it is also somewhat boring and unoriginal. The past few years have had some very exciting new pieces that challenge conventions and experiment with what “Broadway” means, some successfully (Hamilton and Natasha, Pierre, and the Great Comet of 1812) some not so successfully (American Pyscho or Amelie). But regardless of the commercial success, these shows have been worth seeing and talking about because of the experimental risks that they took. 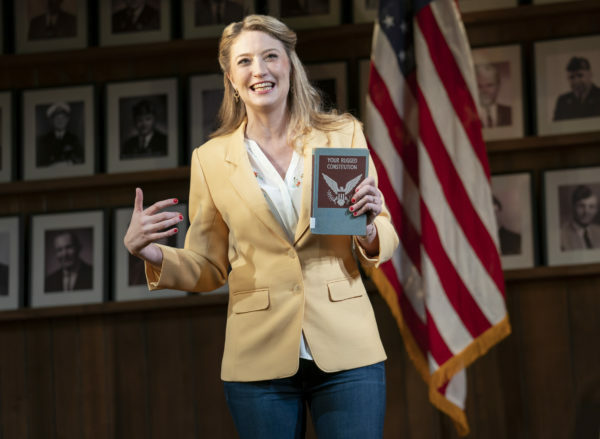 Far from taking risks, Come From Away feels as conventional, low-budget, and unspectacular as a school production and community theater musical. It may be easy to criticize, Come From Away, but it is also easy to sit in the audience, relax, and enjoy the musical–and audiences every night certainly do. 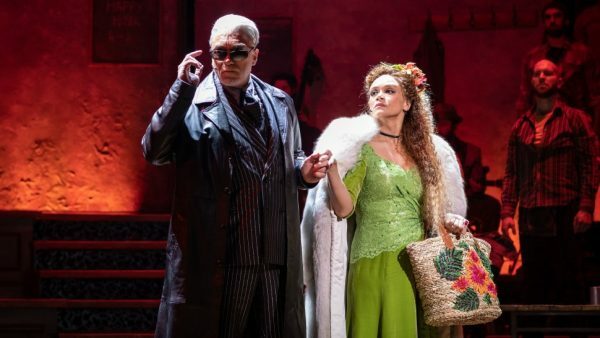 Public support for the show can be seen in many Tony nominations the musical received and few Drama Desk Awards it recently won. 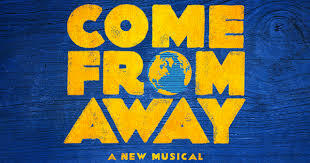 So if you’re in the mood for a short, feel good musical that you don’t have to think about, see Come From Away, you’re sure to have an uncritical but thoroughly enjoyable evening full of Canadian accents, folk music, and quirky characters.